This post describes a project from rOpenSci unconf18. In the spirit of exploration and experimentation at our unconferences, projects are not necessarily finished products or in scope for rOpenSci packages. Data == knowledge! Much of the data we use, whether it be from government repositories, social media, GitHub, or e-commerce sites comes from public-facing APIs. The quantity of data available is truly staggering, but munging JSON output into a format that is easily analyzable in R is an equally staggering undertaking. When JSON is turned into an R object, it usually becomes a deeply nested list riddled with missing values that is difficult to untangle into a tidy format. Moreover, every API presents its own challenges; code you’ve written to clean up data from GitHub isn’t necessarily going to work on Twitter data, as each API spews data out in its own unique, headache-inducing nested list structure. To ease and generalize this process, Amanda Dobbyn proposed an unconf18 project for a general API response tidier! 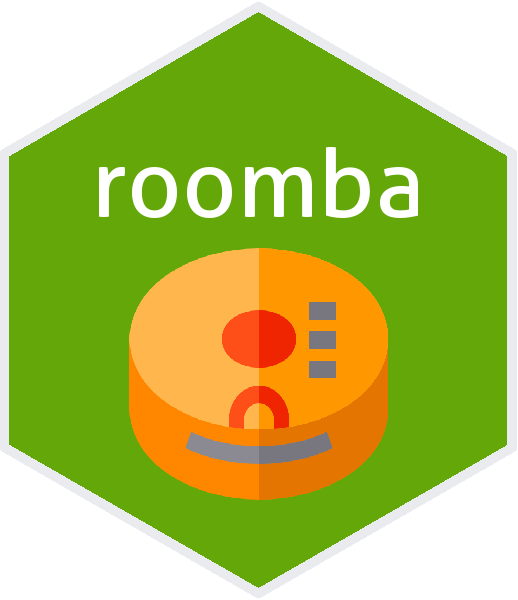 Welcome roomba, our first stab at easing the process of tidying nested lists! roomba will eventually be able to walk nested lists in a variety of different structures from JSON output, replace NULL or .empty values with NAs or a user-specified value, and return a tibble with names matching a user-specified list. Of course, in two days we haven’t fully achieved this vision, but we’re off to a promising start. It was clear Amanda was on to something good by the lively discussion in the #runconf18 issues repository leading up to the unconf. Thanks to input from Jenny Bryan, Jim Hester, Carl Boettinger, Scott Chamberlain, Bob Rudis, and Noam Ross, we had a lot of ideas to work with when the unconf began. Fortunately, Jim already had a function called dfs_idx() (here) written to perform depth-first searches of nested lists from the GitNub GraphQL API. With the core list-traversal code out of the way, we split our efforts between developing a usable interface, stockpiling .JSON files to test on, and developing a Shiny app. We’ve got the basic structure of roomba sorted out, and you should install it from GitHub to try out! Here are a few of the examples we’ve put together. And just the first element of the twitter_data list will show you that roomba has simplified this process quite a bit. ##  "Mon May 21 17:58:09 +0000 2018"
##  "Government can work for the people, by the people, in the 21st century. Help us make it so." ##  "Mon Aug 10 18:59:29 +0000 2009"
##  "Pacific Time (US & Canada)"
We created a Shiny app too, which in its current state allows you to select a .Rda or .JSON file, pick two variables, and create a scatterplot of them. #This doesn't work because "name" and "retweet_count" are at different depths. In addition, we’ve got some features we want to add, such as handling a larger variety of column names (i.e. passing a string for a single column name, keeping all values even if they are all NULL). We would love your feedback on other things we can add (open an issue in our Git repository)!